Repressive acts by the colonial authorities such as the banning of the African drum and the attempts to stifle non-European cultural expressions, not only steeled the will of the practitioners of street culture, but also sent a message to the colonials that they would meet stiff resistance to their efforts to brutalise the masses for merely expressing themselves. It became evident in the Camboulay riot of 1881 and the Hosay riot of 1884. 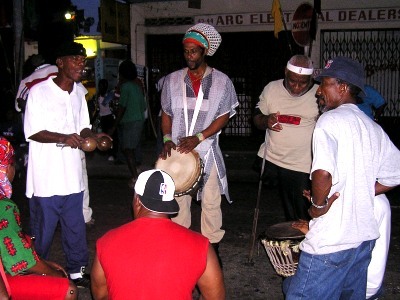 The Tamboo Bamboo ensemble took the place of African drums to provide rhythmic accompaniment for the Afro-Creole street culture. Kalinda, Dame Lorraine and carnival parades all swayed to the beat of the tamboo bamboo - an ensemble made up of different lengths and sizes of bamboo which simulated the four main voices of music, soprano, alto, tenor and bass. The year 1935 is generally accepted as the watershed year for the transition from bamboo to metal. That year the Newtown Tamboo Bamboo band led by Lord Humbugger, discarded their lengths of bamboo and took to the streets for J'Ouvert with a full complement of metal containers. These included garbage bins and covers, biscuit drums, paint cans, brake drums, chamber pots and bottles and spoons. They took the name of Alexander's Ragtime Band from an American movie of the same name and caused a stir in Port of Spain. Led by Lord Humbugger who conducted the band with a baton, replete with top hat, gloves and coat tails and the "musicians" with their music sheets in front of them, they changed the musical course of this land forever. By Carnival Monday evening most of the bamboo bands had followed suit and the streets resonated to the raucous sounds of people chanting to the accompaniment of clanging, metallic sounds. Tamboo bamboo was soon relegated to village activity before disappearing under the onslaught of the new and popular metal bands, which now ruled the streets on any occasion that Creoles could justify taking a good jump-up. Controversy still surrounds the issue of the first person to play a tune on the pan. There are arguments for Victor "Totie' Wilson of Alexander's Ragtime Band who it is alleged isolated four notes of different pitch on the ping pong. The ping pong was a small hand held pan cut from a paint tin or carbide container. The indentations made by striking it with wooden sticks, were pushed upwards to form small bumps, which were then tuned to different pitch notes. Emmanuel "Fish Eye" Ollivierrie of Hell Yard is another contender for the title of first man to play a tune. He was alleged to have played "Mary had a Little Lamb." Totie Wilson tuned his four notes to the chimes of the QRC clock. The range of the ping pong gradually expanded to accommodate the growing adventuresome of the young pan musicians. Winston "Spree" Simon soon became the acknowledged ping pong virtuoso and his performance before the Governor at the carnival celebrations of 1946 made history as both the Trinidad Guardian and The Gazette reported the impromptu concert given by the young steelbandsmen while his band Destination Tokyo was parading before the dignitaries in the Governor's box. Up to that time the steelband was mainly a percussion ensemble, although the ping pong could carry a melody they were used along with the five-note tenor kittle to provide a rhythmic motif or riff to accompany a chant, which the crowd carried with encouragement from the band's chantwells. Other instruments included a two-note bass drum or du-dup, bottle and spoon, brake drums, a cuff boom, graters and other metal objects. This ensemble was created gradually after 1935 and many innovations came to the fore during the war years 1939-1945. Carnival was banned from 1942-1945 and a state of emergency declared which effectively prevented assembly by more than three persons. This did not deter the young, restless steelbandsmen who took to the streets any time they felt like having a jump, which inevitably led to trouble with the police. The panmen of the East Dry River area sued the narrow alleyways, crowded yards and even the riverbed itself to defy the police who used brute force whenever they succeeded in catching up with the perpetrators. The war was drawing to an end in 1945 and the colonial authorities decreed that when the air raid sirens sounded to declare victory on the European front, citizens would be allowed to congregate in celebration. On VE Day, March 8, 1945, the steelband was presented to the world for the first time. Throngs of happy revelers paraded the streets of Port of Spain and in the words of a reporter for the Trinidad Gazette, "They waved branches and chanted songs to the accompaniment of music thumped out of old iron." By VJ Day when the Japanese army surrendered on the August 14, 1945, steelbandsmen were ready and not only in the capital city but also throughout the urban centres of the Colony, steelbands ruled the road. The Carnival of 1947 saw the steelband coming into its own, bands were now playing melodies and simple harmonies and were accompanied by masqueraders, this was to continue right up to the advent of the seventies when the steelband lost its place as the king of carnival. 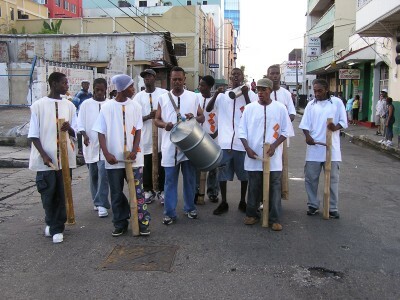 An ugly era in the history of the steelband movement saw the fledgling art form under attack from within and without. The steelband riots started with clashes between bands on the road and carried on after Carnival with violent outbreaks, mainly at the various entertainment spots, created to cater for the thousands of US military service men stationed at the various bases in the colony. While the steelband battles raged on in the streets, another war was being waged on a different front. Society had not accepted the steelband movement and the middle class now saw the opportunity to destroy this abomination once and for all. The editorial pages of the two daily newspapers were filled with bitter diatribes, exhorting the authorities to ban this primitive, savage expression of the dregs of society. Defenders arose to champion the cause; men with vision like Albert Gomes and Canon Max Farquahar used their newspaper columns to cry shame on the detractors. Lawyer and social worker Lennox Pierre, was kept busy defending steelbandsmen in the courts of law, organizing the movement into a representative body and later on teaching the panmen music. Trinidad Guardian editor Sydney Espinet also was an admirer of the steelband and used his influence to negate the effects of the vicious propaganda that the middle class was using in a futile hope to abort the steelband. 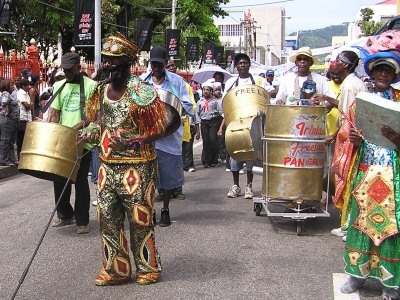 The steelpan is now the national instrument of Trinidad and Tobago. Having progressed from adversity to relative prosperity in a short space of time but this is because of the extreme dedication of members of the fraternity. Steelbands are to be found in rapidly increasing numbers in many parts of the world and the instrument has been accepted by music educators as an ideal tool for music instruction for beginners. 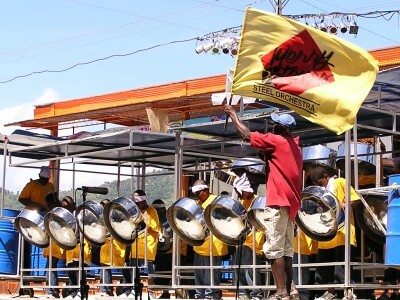 The steelband now has 90 percent capability of the conventional symphony orchestra and attracts the attention of music purists. All this might not have been possible had it not been for the foresight of members of the newly founded steelband association in 1950. formed under pressure from the authorities who wished to curb the escalating incidence of steelband violence, they immediately launched themselves into a project to send a representative steelband to the Festival of Britain in 1951. They selected 12 panmen from among the member bands and had them training under the guidance of Lt Joseph Griffith of the Trinidad & Tobago Police band. The young men chosen for this important task were Sterling Betancourt, Ellie Mannette, Sonny Roach, Anthony Williams, Winston "Spree" Simon, Philmore "Boots" Davidson, Ormand "Patsy" Haynes, Kelvin Hart, Theo Stevens, Belgrave Bonaparte, Andrew "Pan" De Labastide and Granville Sealey. Sealey dropped out early and Sonny Roach fell ill on the boat and had to be put off at Martinique and eventually sent home. They were the cream of he crop, all crack shot panmen, pan tuners and band leaders in their own right. Lt Griffith and Lennox Pierre taught them the rudiments of music and Lt Joseph, shocked to learn that the pans were not achromatized, began the task of putting together a real orchestra from the hodgepodge of instruments that were assembled before him. 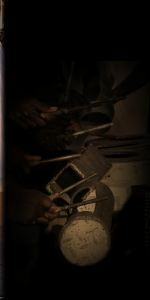 This was the genesis of the steel orchestra, as we now know it. During the 50s, Anthony Williams, Ellie Mannette, Neville Jules and later Bertie Marshall were the innovators who pushed the steelband and its instruments to the levels it has obtained. The 21st Century beckons and the steelband movement now faces the challenge of keeping up with the pace of technology and finding a marketing niche that could exploit the vast commercial potential of both instruments and music.